Speed restrictions put in place during the storm had been lifted at 6 a.m., but rush-hour motorists said the roadway was very slick, calling into question whether it had been adequately treated. 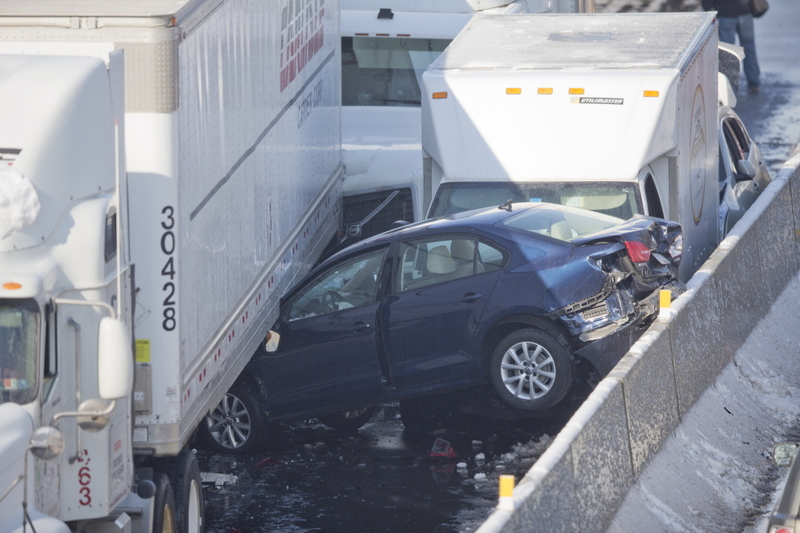 PHILADELPHIA — At least two pileups involving tractor-trailers and scores of cars blocked one side of an ice-coated Pennsylvania Turnpike outside Philadelphia on Friday, injuring at least 30 people and tying up traffic for miles. The eastbound crashes were reported just after 8 a.m., in the middle of rush hour and about five hours after a storm that dropped a foot of snow in the area finally moved out. 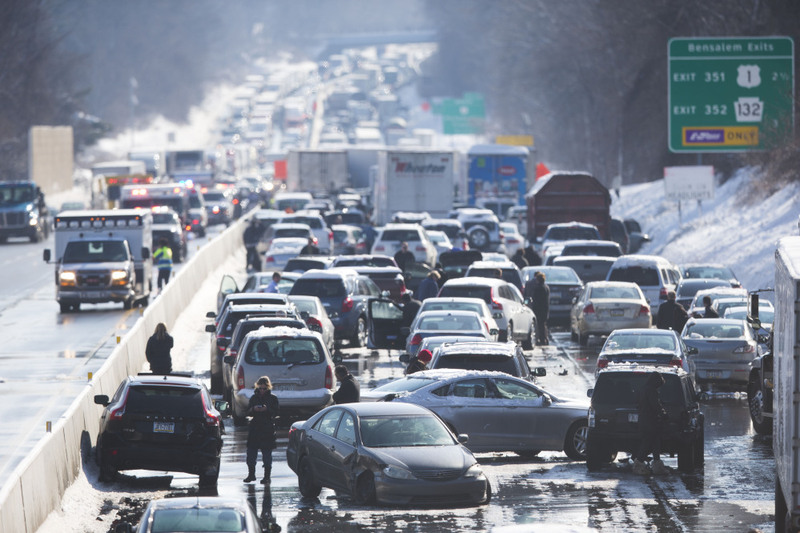 The accidents created an hours-long traffic jam between the Bensalem and Willow Grove exits of the state’s primary east-west highway, and motorists turned off their engines to conserve gas. He said cars were spun around, gas tanks were cracked open and glass and plastic littered the road. Ambulances took 30 people from the scene, but none of the injuries are believed to be major, turnpike spokesman Bill Capone said. Abington Memorial Hospital and St. Mary Medical Center received many of the patients, but spokeswomen at the two facilities said none of the injuries was life-threatening. Officials said it would take time to clear damaged vehicles, including tractor trailers, especially since some could not be driven away. About half of a 5-mile jam had been cleared as of early afternoon, Capone said. The decision to lift the speed restrictions was based on road conditions at the time, he said. Whether conditions changed after that decision would be part of the state police investigation, Capone said. He said he was told the road had been treated but couldn’t say when. Several motorists interviewed by The Associated Press described an icy, slippery highway. Santillo said he was driving 40 to 45 mph, but other motorists were flying by him at 65 or 70. David Hill, 27, said he wasn’t surprised there was an accident. Hill, who works for a wealth management company, was about a mile back and had turned his car off to save gas. Given the nearest exit was about 2 1/2 miles away, he anticipated being there for hours. When a motorist two cars ahead of Wacker banged into a guardrail, he applied his brakes, and his Honda Ridgeline fishtailed but came to rest within inches of the motorist in front of him. “There were bare spots and frozen spots. If you hit the brakes and were on that ice, you either slid into the guardrail or into the guy in front of you or the guy next to you,” he said. Motorists trapped in the traffic jam seemed mostly to be taking their predicament in stride, despite having already been stuck for several hours. Santillo, who had picked up a dozen heart-shaped doughnuts to take to work, passed them out to fellow motorists instead. Volunteers from The American Red Cross of Southeastern Pennsylvania were headed to the scene to bring food, water and blankets to stranded motorists.